So I know I just posted a Heather Hearts News post about things affecting this blog and me personally (the move to Wordpress and some health stuff). I was going to include this next post's subject matter with it. But ultimately, I decided that this topic deserves it's own post. It's all about a brand new book loving community that my friend Ashley of the blog Nose Graze, is developing with her husband. Ashley also runs her own web design and development company, Creative Whim. It will be not just a social media site, but a community, and a better way to keep track of what you read, network with other book lovers, and also find new books to read in a more efficient way! This community is known as LitRate, and it's something I support so much and will be talking about frequently over the next few months! Visit Ashley's Kickstarter page for LitRate and help back this amazing project! The ability to more carefully hone and filter books you're reading for -- like specifically, books with bad boys or fairies or love triangles, or specifically books without any of those things. The ability to give a half-star rating. This might seem like a small thing, but I cannot tell you how much I hate that Goodreads doesn't have it. Save reviews as a draft before publishing them. As opposed to just "shelves" of books you're reading, creating your own virtual library that shows which books you own, have read, have reviewed, and libraries of books you'd like to get. There's so much more to this awesome project. It's something Ashley and I talked about at BEA, she has done a TON of research, and she and her husband are the BEST FIT people to take on this project. Coding God is a server manager and is, as he is billed, a Coding God. Ashley is a design genius, fantastic with coding and development in her own right, and best of all, they are both book LOVERS. Goodreads is now owned by Amazon. And that has changed things a lot. It's good ... but not good enough. And let us not forget the time when Goodreads deleted a bunch of user content. That won't happen with Litrate! And because Ashley and her husband know that so many of us has been on Goodreads forever and have build up an extensive set of data, they know we don't want to start from scratch -- so there will be a tool to migrate all your current data from Goodreads to LitRate. They've thought of EVERYTHING. But here's the thing ... building a site like this costs money. Now, Ashley and her generous husband were totally willing to foot the server cost themselves, which could be upwards of $200-$300 a month. They can design the site themselves. They can design all the functionality, the tools, the features, everything that will make this site the BEST book community and cataloging site out there and the best resource for readers, bloggers, authors, and publishers alike. But in order to gather all the data about all the books in the world, basically, that is needed for this site, they have to purchase a license of sorts. They could go through something like Amazon API or Google API. But honestly, that's what Goodreads does because it is owned by Amazon. And they aren't willing to do this project if it's just going to be a site that's fine, but not the best and not what we readers and bloggers really need. They aren't going to do a sub-par project. They want it to be the best quality it can be. And this license they need to purchase costs between $14,000-$16,000. Keep in mind that their goal is NOT to make a profit from this, only to provide a product/service that self-sustains itself based on ad revenue as it grows. So, Ashley has set up a Kickstarter for this! So far, in just a couple of days, they've raise almost 10% of what they need. There's still a ways to go, but we have thirty days to make it happen! I know Ashley personally. I know that there is no one better for this project and that this will change things and simplify them for blogger and readers immensely. I know she can provide a better product than any major corporation can because she is a reader and she is a blogger and she knows what we need better than anyone. If there were some sort of government for book bloggers or something, I'd vote her president in a heartbeat. I believe in this project enough that I was willing to back it and I'll be totally open. I'm a cancer patient and money is tight. But I put forward $20, because it's worth it to me and I see it as an investment in my blog's future and also as something I'll enjoy as a reader. But even if you've only got a couple bucks, it will count! And they've got lots of incentives if you support them. Because I donated $20, I get guaranteed access to the beta version, which was really important and exciting to me -- it might be really exciting for you, too! I would've donated more if I could and if I get the chance to before the month is over, I still might. Please consider donating even a little bit to this awesome project. If you love books, book blogs, are a blogger, or just lover interacting with other book lovers, then it's something you'll love. I have every faith that it will surpass every expectation! Great post! 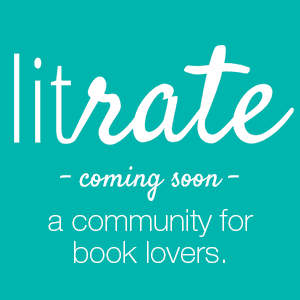 I'm so excited about LitRate and I can't wait to see it in action!